I just wanted to write a little about my experience using a Versahaul Trailer with my Vespa GTS300 Super Scooter. Last fall I was in a little predicament when Hurricane Sandy hit. We all had a few days notice a BIG storm was coming. The weekend prior I was on the Jersey Shore where I keep my Vespa. It was brand new for 2012. For someone who previously owned a Harley Davidson and a Yamaha R-6 buying a Vespa was a step in a totally different direction. I still miss my Harley very much but the crotch rocket was hurting my shoulder when I was riding it. No fault to the R-6, but it was more that my shoulder ached after riding for long periods of time. Anyway, I am digressing from Hurricane Sandy and the problem I had last fall. It seems I only had a few days to get my Vespa off the Jersey Shore or it would for sure be a goner. I keep it in a parking garage which is a good thing. The bad thing is that the sides of the garage are open and although covered, Hurricane Sandy surely would have made mince meat of the Scooter if I left it. I wish I prepared for something like this but the fact was I was not prepared. I needed to get the Vespa north to the Safety of my Tool Warehouse which was 50 minutes away on The Garden State Parkway. So what was the problem? The problem was although the Vespa can do 80 MPH, I really did not want to go on the Parkway with all the crazy drivers doing 80-90 MPH. I had no choice. With my motorcycle experience and my fingers crossed I jumped on the GSP and drove my Vespa to safety. All winter my Vespa was safe and sound in storage but I knew as soon as the weather broke I would want to ride again at the beach. This time I bought a Vershaul Trailer from the Vespa Dealer where I originally purchased my Scooter. I was really doubtful the Vershaul would work with my Vespa. Especially with my Jeep Wrangler and the tire in the back. However the dealer said don't worry it is going to work. I followed all the instructions that came with my Versahaul which were very brief and to the point. I did have to make a call to the mfg. and ask a few questions about the assembly but all in all it is very simple. I am not sure why there are not more instructions about how to secure the Motorcycle or Scooter to the Versahaul? I had to look on the web to various websites like Modern Vespa for tips. Anyway, after my experience this past weekend I felt inclined to write a little bit about my experience with Versahaul and I have to say they make an excellent product. Certainly heavy duty and certainly did the job flawlessly. I really thought that my Vespa would fly off the Versahaul after I hit my first pothole but that was just not the case. 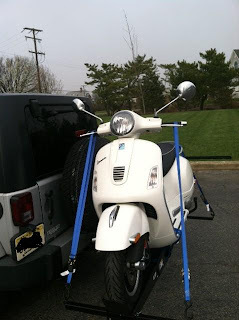 For around $500.00 I now have the ability to tow my Vespa anywhere at a moments notice. You don't have to register it with the State like other trailers. It is made in the USA which although I own a Vespa, I do like to buy U.S. made items as much as possible. The one thing that I would recommend to anyone who is thinking of using a Vesrsahaul is to get a good set of tie down straps. I was lucky enough to sell them, because I had a really bad pair I was going to use at first, until someone at work mentioned we have some really heavy duty Erickson ties downs on our shelf. These worked like a charm and the cheaper straps I used on an old Waverunner of mine certainly would not have worked at all. Below are some pictures of the adventure I had last weekend. I am giving big props to Versahaul on a great product!